Strapping Speed 1.5 Sec/Strap Min. Max. Packaging Size Any Size. Weight 100 Kg Sealing Method Heat Sealing. 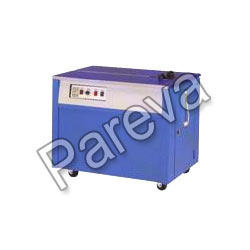 Established in the year, 2005, we 'Pareva Pharma & Packaging Machinery' are an eminent organization involved in manufacturing, supplying, exporting and importing an impeccable range of Packaging Machine. Additionally, we are offering a wide gamut of Conveyor Belts, Dies & Punches, Process Equipment and Tablet Making Machine. In aforementioned range, we are offering FFS Pouch Packing Machine, Pallet Stretch Wrapping Machine, Continuous Sealing Machine, Carton Sealing Machines, Fully Automatic Carton Sealer, Carton Sealing Machine, Soda Shop Machine, Soda Machine, Liquid Filling Machine, Automatic Pallet Stretch Wrapping Machine and many more. The entire offered product-line is manufactured by making use of premium quality required raw material such as procured from the established vendors of the industry. With due consideration, the offered gamut is developed in such manner so as to ensure its compliance with the defined parameters of the industry.